The ruling party, however, maintains its majority in parliament and shows no inclination to step aside. Armenia's parliament has elected backbencher and protest leader Nikol Pashinyan as the country's new prime minister, capping his historic, peaceful uprising and sending his supporters into the streets again to celebrate. At a special session on May 8, the parliament voted 59-42 to elect Pashinyan, just more than a month after he launched a protest movement that inspired the country's dissatisfied but hitherto cynical citizens out into the streets to oust longtime leader Serzh Sargsyan. When the result was announced, Pashinyan supporters who had gathered on Yerevan's central Republic Square to watch the session (livestreamed onto big screens) shouted “Nikol” and “Victory,” and popped corks of champagne bottles, spraying the crowds. Thirteen members of Sargsyan's ruling Republican Party – which still holds a majority in parliament – voted for Pashinyan, just barely more than needed to push him over the threshold. In a similar session a week before, all but one of the Republicans voted against him in an apparent last-ditch effort to retain power. That result sent Pashinyan's supporters out onto the streets again and Republicans quickly capitulated, announcing that they would not block Pashinyan's election in the next vote. Though this vote lacked the drama of the previous week's – when the Republicans did not tip their hand about whether or not they would vote for Pashinyan – the ruling party nevertheless signaled that it did not intend to give up the fight. “The Republican Party has made the political decision to support the candidate nominated … for the sake of stability in our country,” said Vahram Bagdasaryan, the head of the Republicans' faction in parliament, in a speech before the vote. At the tense, eight-hour session the week before, Republicans peppered Pashinyan with questions about his commitment to Armenia's ties with Russia, the country’s traditional family values, and economic growth. Bagdasaryan said today that they were voting for Pashinyan in spite of the fact that they were not reassured. In his turn, Pashinyan showed no inclination to back off on his ambitious agenda to remake the country, and no indication that he wanted or expected any cooperation from the Republicans. He presented a program heavy on economic development, with proposals including boosting the country's growing high-tech sector and defense industry, reviving agriculture and promoting tourism. “Many people will want to see a country that has carried out this revolution of love and solidarity,” he said. The road ahead will be tough not least because Pashinyan will be stuck with the recalcitrant Republican Party majority indefinitely. Within 15 days, Pashinyan will have to present his cabinet to the parliament, and 20 days after that, his program. While the Republicans could block those, in theory, doing so would trigger snap elections in which they would certainly lose seats. For his part, Pashinyan will want to wait to hold new elections until he can get a new electoral code in place to help ensure the free and fair elections he has put at the centerpiece of his overall strategy. After the vote, Pashinyan headed to Republic Square, the center of the protest movement that brought him to the premiership. The crowd of supporters gathered there illustrated the growing adulation of Pashinyan himself: His image dominated signs, and many attendees had T-shirts featuring his face. Others wore camouflage T-shirts or caps mimicking Pashinyan's signature style (though he himself was in a dark suit). 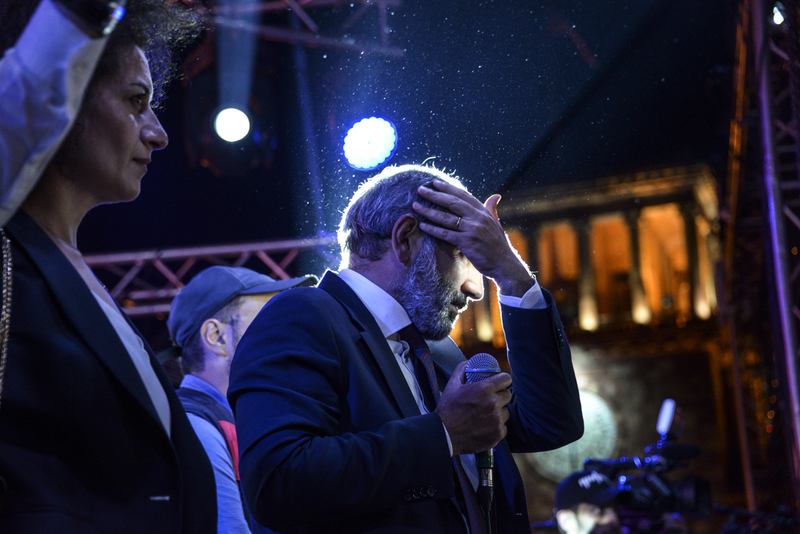 After Pashinyan left – to be formally sworn in as prime minister – the party continued on the square. A truck appeared full of snow from a mountain village, and many celebrated with a snowball fight.